Bruce Springsteen has been in Australia this month, playing epic shows around the country, all the while his latest album High Hopes, hit No 1 in the US and several other countries. At the centre of that album, and his recent live setlists, is a duet reworking of his song ‘The Ghost of Tom Joad‘ with Tom Morello, previously guitarist with Rage Against the Machine. It’s a great version, gaining much praise, though perhaps is not as starkly effective as the original acoustic version. (RATM also did their own version in 1997). The Ghost of Tom Joad is about the main character from John Steinbeck‘s famous novel The Grapes of Wrath, generally regarded as an American classic, and which has its 75th anniversary of publication this year. It tells the story of Tom Joad, a just-paroled convict who, in the Great Depression, leaves with his family from the dust-bowl farms of Oklahoma on a pilgrimage to California, in the hope of work and a better future. Upon arrival, they face complex social issues, including a lack of work, little welfare, and oppression from larger corporations. There is some communal organisation in the struggle, but Tom, after witnessing his sojourner Jim Casy (a former preacher) killed, commits another murder, and must go on the run, determined to make a difference. It’s a novel about the absolute desperation of regional poverty during the depression, and the despairing experience of people caught with no options (like a turtle flipped on its back). 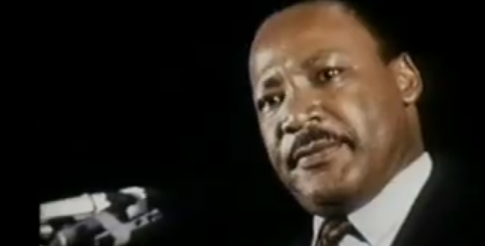 This famous hymn, most often put to the tune for ‘Say, Brothers, Will You Meet Us‘ (and the nursery rhyme ‘Little Peter Rabbit had a Fly Upon his Nose”) also finds another place in posterity, as it’s first line became the final words in the last ever speech by Rev Martin Luther King Jr on April 3rd, 1968. He was shot dead the following day. He is adopting a Moses-like position as the people’s deliverer. But the prophetic nature of his declaration, of seeing, but not personally reaching, the promised land is made starker by our knowledge of his martyrdom the next afternoon. This grand story of liberation, exodus and pilgrimage has been a defining narrative for the civil rights movement. And the promise hope of God’s justice equally so for the poor. The weaving linkages of these biblical words and themes is an example of the way on which the Biblical narrative is soaked into cultural history, especially as it comes to bear when the struggle for justice is at play. The thirst for justice is a universal human instinct, reflecting the mark of God. 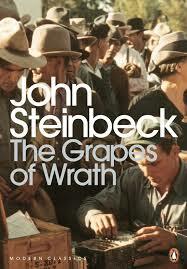 The Grapes of Wrath shows how acute that thirst can be. And how pathetic are easy answers and utopian dreams in not rooted in action. It’s also a novel which rejects a superficial religion which is all talk, but not active in the presence of the gritty struggle of the poor. The character of Jim Casy is most interesting here. A former preacher whose dualistic religion has him torn between the hyper-spiritual and the profane, indeed between praying for young girls, then lusting for their flesh. This kind of spirituality is untenable, and when we meet him, he has given up on the spiritual, has swung the other way, trying to philosophise a holiness that is only physical, earthly and practical. Paradoxically, he becomes almost a unique Christ-figure, an explicit affront to those whose religion is of a super-spiritual Christ, distant, aloof. Whose Christianity is private and sublimated. As the novel progresses, Casey becomes a social organiser, and then martyr, and is the catalyst for Tom’s transformation. It fascinating how deeply the Bible is the mix of such matters, even when it may not be explicitly recognised as such. 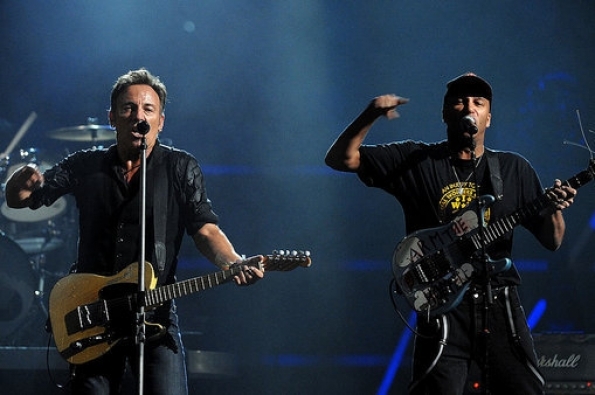 Springsteen wants to sing about injustice, but he can’t help but draw on the Bible too. Nothing else seems vast enough. More specifically, the Revelation 14:19 verse mentioning ‘the grapes of wrath’ is part of a larger passage which encourages God’s people to persevere in the midst of severe persecution because of the magnificent and final justice which Jesus Christ shall one day finally establish. It takes the matters of evil and injustice seriously. It is a call to remember that vengeance belongs to God, and that current suffering is not meaningless, but actually plays some role in the climaxing of wickedness, the ‘ripening of the harvest’. It is a passage of serious celebration. The kind one sees in the faces of those people who emerge from court, having experienced justice served. There is a wrath of God. Evil itself shall be dealt with. And so there is profound hope in God for those who suffer injustice, oppression, and the systemic consequences of evil. But also, yes, this should be our concern today. For when we fight injustice, not only are we obeying the teachings of Jesus himself, but also anticipating that coming justice – the reconciliation and renewal which is the end in view for the whole creation. It should change how we act now. Theologian Jurgen Moltmann writes that we should be oriented in the present by the genuine hope in the future: “From first to last, and not merely in the epilogue, Christianity is eschatology, is hope, forward looking and forward moving, and therefore also revolutionizing and transforming the present’. The Christian understanding is that the ultimate redemption of the world is certain, and the almighty God of Love & Justice will indeed redeem the whole earth which is indeed ‘growing heavy for the vintage’. Because of that, we stand with those who are oppressed, we fight for justice, we persevere with those on the pilgrimage, and wherever there seems the ghost of Tom Joad, we first see the Spirit of Jesus Christ.